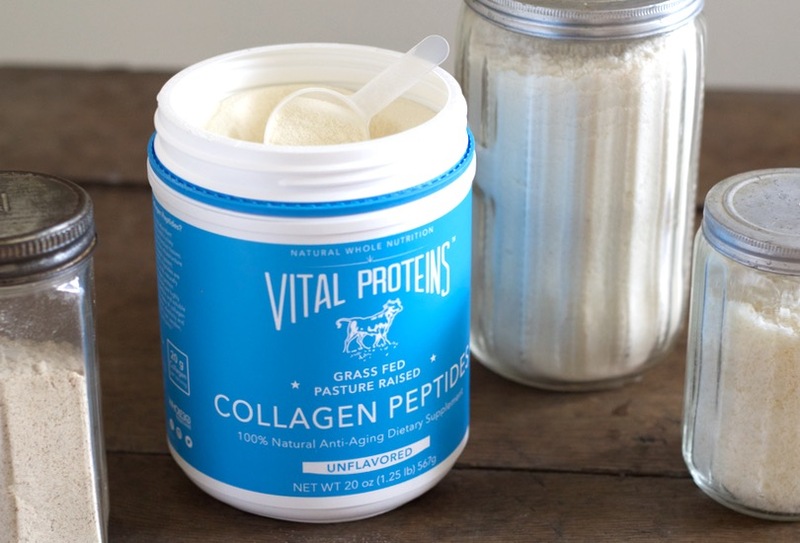 Many of you are familiar with collagen protein, the only protein powder I use and recommend. At my home, you’re much more likely to find meals that include collagen protein than meals without this superfood addition. For example, at breakfast I’ll spike my coffee or grain free porridge with this protein boost. If lunch is soup, such as my Healing Green Soup, I’ll often stir in a spoonful collagen. And on the occasions that I make a treat, I may reach for my Protein Cookie Dough or Cake Batter Collagen Bars. Collagen protein, which is available here, dissolves without flavor in any liquid or batter. As a result, I felt inspired to try my hand at baking with this superfood. I found that it works beautifully in these grain free muffins, lending a delicate and slightly chewy texture. The collagen, along with the eggs in this recipe, creates a high-protein result. 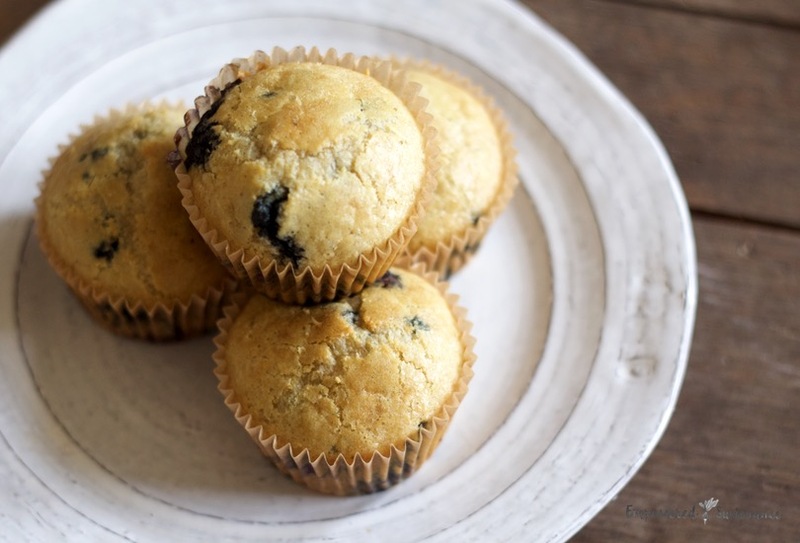 Each muffin offers about 6 grams of highly-digestible protein. Also importantly, the protein is balanced with healthy fats from the egg yolks and coconut oil. Protein cannot be utilized in the body unless it is accompanied by fat. A high-protein, low-fat diet is not a route to long-term wellbeing. For more information on collagen, please read my page How To Use Collagen. 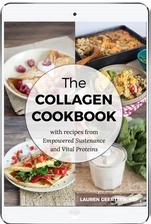 Additionally, access my free download The Collagen Cookbook at the top of this page for more recipes. 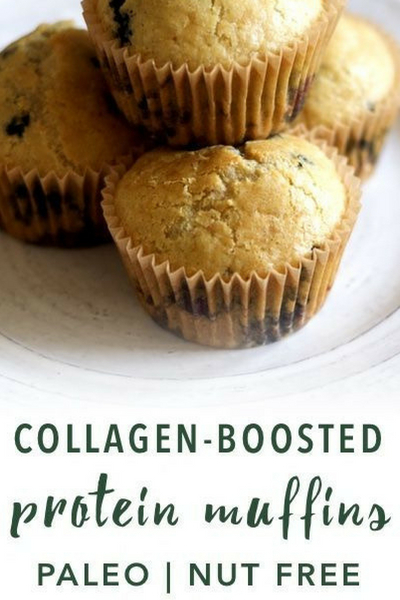 Collagen protein provides a hearty protein boost to the muffins, and creates a delicate, slightly chewy texture. Eggs are essential to this structural integrity of these muffins, and I do not think egg replacers will work here. The high proportion of coconut flour requires eggs as a binding and leavening agent. Arrowroot flour is made from a starchy root, and helps lighten the often heavy quality of coconut flour. You can find it in health food stores and large grocery stores. These fluffy blueberry muffins feature collagen protein, the only protein powder I use and recommend. Collagen has been shown to support skin, joint, and digestive wellbeing. Preheat the oven to 350 and line 9 to 10 baking muffin cups with unbleached liners. Have all ingredients at room temperature. In a mixing bowl, add all ingredients except the blueberries and stir with an electric mixer. Stir the blueberries into the batter. Divide the batter between the muffin cups and bake for about 25 minutes, until golden on the top and a toothpick comes out clean. Will a vanilla protein powder work here instead? Thanks Lauren! Also, I just found out I am allergic to eggs :O I would love to make these, but do you think there is any chance a flax or chia egg would work? Could I a banana in this recipe and omit the blueberries? Would I still need the coconut milk? How many calories in each muffin? Is there anything to replace arrowroot that isn’t a starch or would this recipe work without it? I have a friend who has Crohn’s disease plus a few other problems – very restricted diet – however she can eat everything in this recipe except arrowroot and maple syrup. What is the calorie count per muffin? I use Great Lakes collagen, can I use this in the recipe? Hello! Can I substitute the arrowroot and coconut flour for a paleo blend that I have that’s made up of almond flour, coconut flour and arrowroot flour?